Many people and businesses own small air compressors that are used for tasks such as inflating tires and balls and spraying paints and varnishes and running air tools like nailers, impact wrenches and air ratchets. 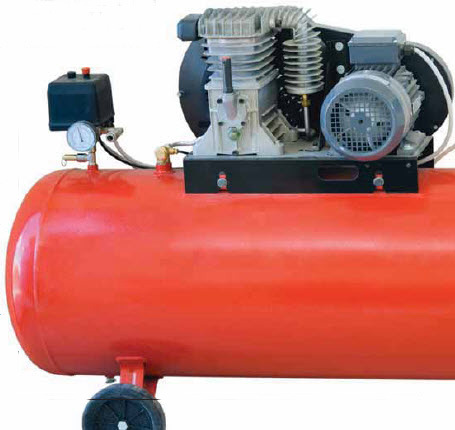 Oil-lubricated home compressors are typically powered by an electric motor that is connected to the pump unit either directly or by a belt. When the electric motor turns the pump unit a piston creates a vacuum as it travels down the cylinder and pulls air through the inlet port. As the inlet valve closes and the piston travels up the cylinder, air is compressed and pushed through the discharge port and into the tank. The tank is filled with compressor air until it reaches a preset pressure, at which time the motor and pump shut off until the pressure in the tank drops to a predetermined point and needs to be filled again. Although driven by an electric motor, oil-lubricated piston-type small air compressor pump units contain a crankshaft, valves, pistons, piston rings and bearings that require lubrication. Like the engines found on push mowers, compressors of this type often rely on a splash lubrication method to protect parts against wear. Compressor maintenance is not a high priority for many people. Compressor units tend to be used only on an intermittent basis, and the oil is rarely, if ever, checked or changed. However, like any other engine, it is important to check the oil level occasionally and top it off if necessary to ensure optimum equipment protection and performance. Reduce friction and dissipate heat. The more the pump unit runs, the hotter it becomes. 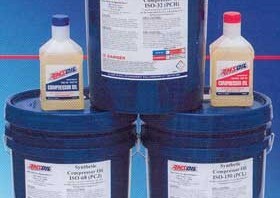 Reisist sludge and varnish to keep valves from sticking or leaking. Minimize foaming. Foaming is a common byproduct of splash lubrication systems, leading to overheating and oxidation problems. Corrosion and Rust control. Water is a natural byproduct of compressed air, often working its way into the compressor oil and leading to rust and corrosion problems in the pump. Good cold temperature performance for units used in cold climates. Engineered to meet the tough demands of industrial compressor applications, AMSOIL PC Series Synthetic Compressor Oil provides outstanding protection and performance for small compressor applications. PC Series Compressor Oil incorporates the highest quality, thermally stable synthetic base stocks and premium non-detergent, ashless additives for maximum protection at high temperatures and pressures, lasting up to eight times longer than petroleum oils. Contains anti-foam additives to resist foam and reduce heat, oxidation and wear.